I've been looking for a public domain book I've never read to print and bind, and decided on the Journals of Lewis and Clark, or History of the Expedition under the Command of Captains Lewis and Clark. To The Sources Of The Missouri, Thence Across The Rocky Mountains And Down The River Columbia To The Pacific Ocean. Performed During The Years 1804-5-6. It's the original two-volume History, originally published in 1814. You can see how it turned out in the photographs. The spine is nice and flexible, strong, and it's easy to read. You can see how it's thrown up when the book is opened to the middle. The book has a nice solid feel, and I'm really happy with the way the typesetting and printing turned out. Most of the flaws have to do with covering the book; the labels and the hollow back. More on that in the last section. For this book I'm using the Project Gutenberg text based on the 1814 expedition history prepared by Paul Allen and published by Bradford and Inskeep in New York. This edition is an abridged version of the original journals. Project Gutenberg also has a more complete set of the journals, but when I compared the two, I found the edited version to be much easier to read. The definitive edition is a 13 volume set published by the University of Nebraska Press and edited by Gary E. Moulton (called the "Nebraska Edition"). There's an on-line version of this edition, but I can't say I'm interested in doing a 13 volume set, and it would probably violate Copyright anyway. I typeset the journal using pdfTeX on full size paper. The font is Adobe Garamond Premier Pro, 1.5 times larger than the default 11 point size. Then I used the 'psutils' utilities to reformat the pages into folios (2-up), with eight sheets (16 leaves, 32 pages) per signature. I wound up having to tweak the margins a bit. 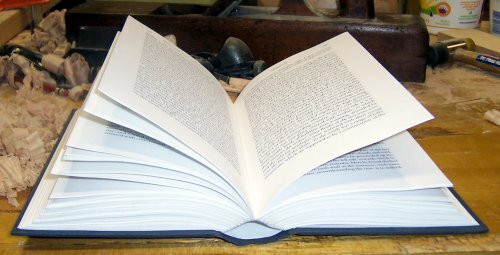 The general rule is that when the book is opened flat, the fore edge margins should equal the gutter between the text on the two pages. I decided to make the gutter a bit wider to make the book easier to read. In my journal project I found that the paper I'm using (Mowhawk Superfine) doesn't drape particularly well, so a wider gutter will reduce the stress on the spine. pdftex lewis_clark_allen_vol_1.tex -- Produce a single page PDF of the book. | pstops "2:0(-37,0),1(5,0)" \ -- Move the text block to the left for even pages, and to the right for odd pages. This increases the width of the gutter. | psbook -s32 | psnup -2 > lewis_clark_allen_vol_1_book.ps -- Rearrange the pages into 32 page (16 leaves, 8 sheets) signatures, format them two to a page, and put the result into a file. ps2pdf lewis_clark_allen_vol_1_book.ps -- the 'psutils' programs mess with the ability to print the result in a duplex printer, so I convert the final PostScript back to PDF. I've found that pretty much any printing place knows how to handle PDF, so it's probably a better final format the PostScript, even if technically it isn't. The end result is a 524 page book, printed on 136 sheets of short-grain Mohawk Superfine 28/70# paper. I used the same binding I've done for the two other books I've bound; sewing on tapes, zig zag endpapers, hollow back, library style binding with cloth covers. For this book I didn't use split covers, but pasted the flange to the underside of the book board, then covered the book with book cloth, and pasted the endpaper paste sheet onto the cover. Since I don't have any of the finishing tools necessary for titling the spine or the cover I decided to experiment with gluing paper titles onto the cloth of the spine and front cover. For the spine, I cut the book cloth to size, marked the center of the cloth and glued the paper title onto the spine. I used PVA glue, hoping it would hold the paper onto the cloth better than paste. I pressed the book cloth for an hour and then wrapped the cloth around a cardboard tube, followed by a layer of waxed paper, held tightly with duct tape. This was to allow the paper to conform to the slightly curved shape of the spine. Once the cloth was pasted onto the book, I simply glued the front cover title onto the front of the book and pressed the book as normal. 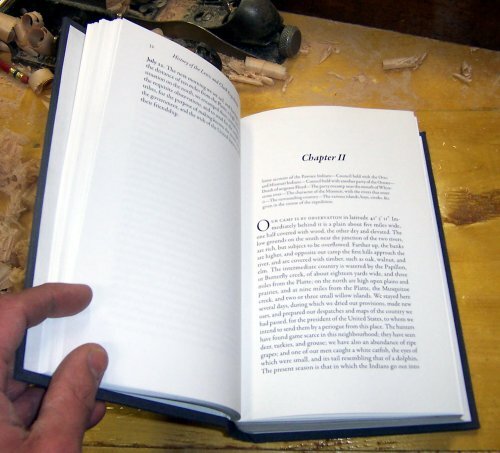 I think the paper that forms the hollow back should extend past the text block so that it can be trimmed to the height of the covers instead of the height of the text block. 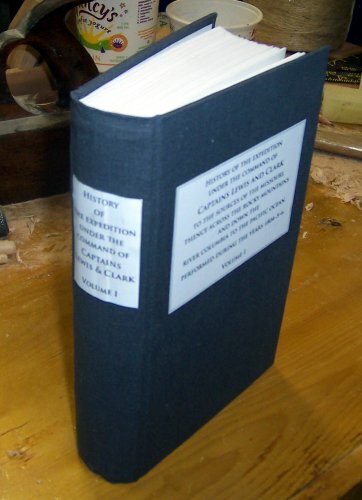 On this book the paper tube was flush with the text block, which results in the book cloth having nothing substantial to paste over on the top and bottom of the spine. Not only is it more difficult to get the cloth to glue smoothly to itself, but it's not as solid a structure as it should be. Since books are often pulled off the shelf by this area, it needs all the help it can get. Gluing a paper title to the spine didn't work. The paper stuck reasonably well, but it's wrinkled in a few places along the spine. I think that the paste applied to the back of the book cloth weakened the glue on the paper while I was covering the book, but in any case, now I've got a paper title sort of stuck to the spine. I can't pull it off because it'll leave most of it on the spine and I'm not sure how to glue it back down more solidly. Depending on how it looks after the book is finished, I may see if glue in a syringe can get under the areas where the paper is coming off the cloth. Next time maybe I'll try painting the lettering onto the spine, or gluing the label on after the book has been covered. And on the subject of the labels, I think they're too large. They seemed right when I held them up to other books of a similar size, but now that the book is done, they seem too big and out of proportion. My rounding and backing still needs work. In this case, I waited too long after I rubbed glue into the spine before I started and the book didn't round easily. I did eventually get the proper round in the spine, but it was uneven, which meant that groove between the cover and the edge of the spine isn't the same width on the front and the back. I had more luck with backing by using wooden screw clamps on the underside of the press to hold the text block down and even, but I still need to make some real backing boards. Because the edge of the spine is so close to the top of the jaws of the press, it's hard to get the backing hammer to really make a crisp shoulder. If the spine were raised up by backing boards, I'd have room to get the hammer over the edge. My book covering technique also needs work. I used a thicker mixture of paste this time, trying to avoid the ink bleeding I experienced with the red book cloth and to keep the book cloth more stable, but the paste dried faster and the turn downs on the top and bottom of the covers didn't really stick. As a result, the top and bottom edges of the covers aren't crisp. If the book was to get a lot of use, I'm sure the cloth would wear out and tear at this junction. I also need to practice mitering the corners.